Africa inland from the coastal strip is dry and dusty. Rain falls seldom, and when it does riverbeds become cataracts that vanish in the sand. A few Southern African rivers survive long enough to meet the ocean. 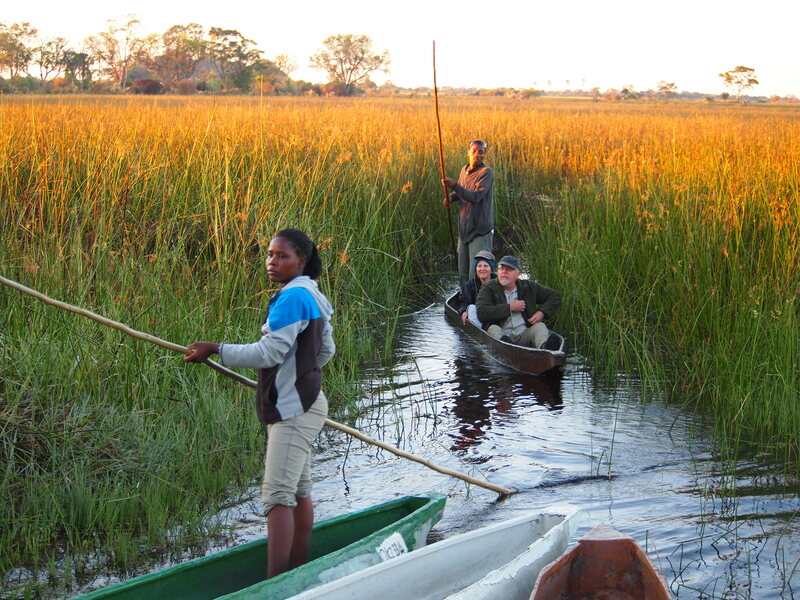 One, the Okavango forms a vast inland delta in Botswana , where a tectonic trough receives it water. Its northern cousins are the Sudd in South Sudan, and the Inner Nile Delta in Mali. In late summer, fresh water arrives from Angola to renew a wetland that is 250 kilometres by 150 kilometres in extent. By mid-winter, this inland delta has swollen to three times its normal size. It spreads across savannah to the delight of rhino, elephant, hippo, buffalo, a smorgasbord of lechwe and other antelope, and predators including lion, leopard, cheetah and nile crocodile that watch from banks. Overhead, fish eagles and fishing owls compete with crested cranes and sacred ibis for a rich harvest of tiger fish, tiny tilapia and catfish seeking shade beneath water lilies. This is when tourists arrive in ever-increasing numbers. Can Africa compete with European expectations? You bet it can, although perhaps not within your paradigm. The Okavango Delta Botswana is landlocked. If there were roads they would be submerged in season. Visitors fly in to Maun from the international airport in Gaborone. Do not expect a European way of doing things. The next pub is a day’s drive away. From Maun, light aircraft ferry travellers to landing strips on islands for transfer via flat-bottomed speedboats to isolated camping spots. These are self-contained so bring your medication. You can stay at a guesthouse but to experience the real Africa, choose a tented camp, where shadows passing by at night are hippos on their way to water and elephants browsing through the dark. You are safe in nature provided you remain inside your tent. In the morning, take a crisp bush shower. Privacy is simple; you respect each other. The food is something else though. Expect European cuisine. Prepare to be surprised. Your stress unravels as Botswana people pole you through shallow crystal waters with gentleness to match your mood. Your mokoro canoe is a hewn-out tree trunk. Take insect-repellent, sun factor, water and a few nibbles. Here are no fast food outlets. Africa expects her people to be self-sufficient, and camp is a distance away. There is no twilight and the night falls quickly. Soul mates gather around to share adventures. The wood burns well, the beer and wine are cool and the barbeque is mesmerizing. As the conversation winds down and the sounds of the African night take over your guide leads you to your tent. You can go grander but you will not sleep better than you do tonight, and that I promise.